That’s right! The wait is over! Sinc Bucina, Terci Ruina, and Cursus Iteritas Percido are being released April 18th! That’s not even that far! Are you excited? We are! Also exciting: Preorders will open on Mar 29 (THIS FRIDAY! ), so if you’re at Synthplex, drop by our booth to check it out and order yours! Bonus: Preorder at our booth at Synthplex for a special discount! Want to know more? Here’s an overview, and more content coming to the NE page soon! We have a lot of modules that languish in prototype for a long time. Sinc Bucina was one of these. SB started life several years ago when Stephen just wanted to make a low-pass gate because they’re cool (obviously). The first version didn’t really do much, though, so it sat on a shelf. September 2016 saw the passing of Don Buchla and reminded us of this module, and we dusted it off. A bit of tweaking and we had some great features. Use the Ping input for standard LPG behavior: stick a trigger into it, and you get variable release time. However, it’s velocity dependent: a higher voltage trigger opens the gate more, a lower voltage trigger opens the gate less. Run your trigs through an attenuator like the Lapsus Os or Sinc Defero for awesome performability, or through a VCA for sequenced, expressive dynamics. Next, the Gate input offers slew behavior, meaning it does a lot more than your standard ASR envelope. Run in a voltage sequence and use the Attack and Release controls to smooth things out. And, again, since it’s a slew, even if you’re just using gates you can vary their voltage to create new dynamics. SB has three modes: A 12db filter slope, a very resonant 6db filter slope, and a VCA mode. SB is technically our first analog filter. It’s based on simple 2164 single-pole low-pass filters. It’s also one of the most aggressive and expressive LPG’s we’ve ever played with. SB is 100% analog, but doesn’t use vactrols (for a whole host of reasons). The envelope section includes a simple model of some of the odd nonlinear behavior that vactrols exhibit so the attack and release times will vary a little based on how they are triggered. Around the time we fleshed the ideas out for this, we were running low on our old clamping VCA module, the Sinclastic Empulatrix. SE was one of our very first modules, and had a great run, but rather than offer two VCA-type modules in a very similar package (they’re completely different under the hood), we opted to discontinue the former and offer only the new SB. (Watch the blog for more info on the differences between the two in a few weeks!) Basically, we think SB is awesome, and we hope you’ll like it too. Go get it on April 18th! Want to read up so you’re prepared the second it comes out? Check out the manual and preorder yours on the shop page! Distortion! Do you like distortion? How about not one, not two, but THREE analog distortion circuits in one awesome 4 hp package? If you said yes to both, Terci Ruina is the module for you! Even if you didn’t, we bet you’ll like it anyway! We’d been thinking about distortion modules for a long time. TR came from an old prototype that had six different distortion circuits that we’d made just to experiment with. After finding that prototype in a closet and playing around with it for a while, we discovered three of the circuits sounded pretty great when routed in series. And thus, we had the idea for Terci Ruina. Unfortunately, while the concept was there, the birth of TR was...laborious. We found that Eurorack requires a very specific type of distortion to create anything interesting, and that the standard distortion circuits we’ve all heard before didn’t do what we wanted to. After loads and loads of tweaking (so many value changes!) and a slew of prototypes, we came up with the module you see today. The first section, FB, is a two-stage asymmetric-diode feedback topology using high-beta bipolar transistors for gain. It ends up being a very nonlinear waveshaper that is sensitive to waveform symmetry. FF is an asymmetric feed-forward diode clipper using op-amps for gain. This one is a pretty straight-forward diode clip with just enough asymmetry to make it fun. The last section, FZ, is a high-gain bipolar fuzz. The knob blends between differently phased sections which gives the knob a low-pass to high-pass frequency response as it is turned up. Yep, they’re normaled, so patch in and out wherever you want. Because, you know, it’s modular. In layman’s terms, it’s awesome, and ridiculous, and untamed. It’s noisy. It may pick up radio stations. And, like, seriously, this thing will distort stuff a LOT. But don’t take our word for it. It’ll be out, you guessed it, April 18th! And you can see the manual early and preorder yours today on the shop page! It’s big! It’s cool! It has one giant knob and 15 small knobs! And two switches! And a button! And 18 CV inputs (that’s NOT a typo)! And two CV outputs! And a trigger input! And a sync input! And an audio output! Did we mention it’s big and cool? 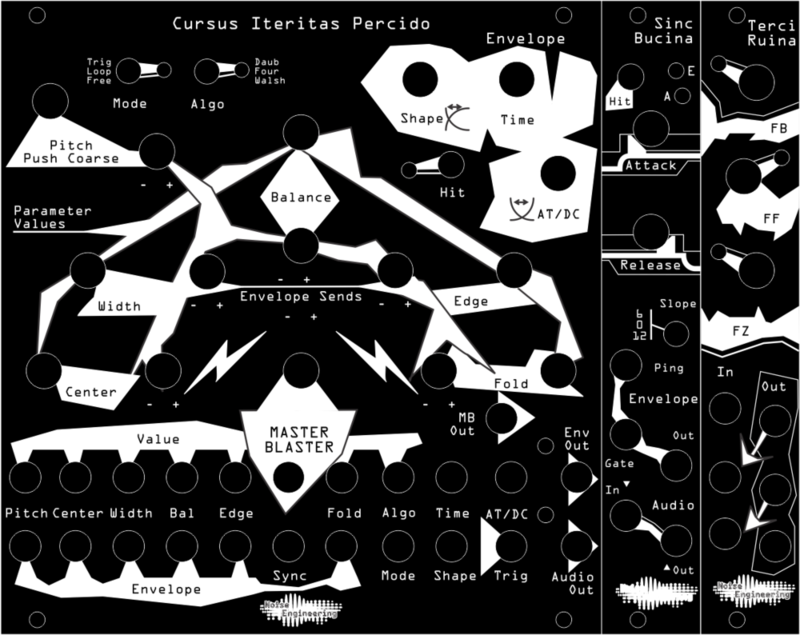 Cursus Iteritas Percido came from a patch our friend Baseck showed us a while back using mixed CV signals to create percussion from Cursus Iteritas (as well as some of our other oscillators). That patch is also where Roti Pola came from, coincidentally. But we knew right away we had to do something bigger with the whole concept. Initially, we were simply going to adapt the Cursus Iteritas into the Loquelic Iteritas Percido platform. But we couldn’t stop there. We wanted it to be performable, expressive, and more immediate. While it shares the same envelope and routing options as the LIP, we had the idea early on to add the awesome Master Blaster knob: it’s a performance-oriented attenuverter over those six envelope sends. Think of it like a macro knob. It also has a CV out so you can tie it to the rest of your patch (one knob to rule them all and such). Our first prototype blew us away. I mean, it sounded AWESOME. We worked really hard on this one and we think you’re really going to like it. And, big shock, the manual and preorder is on the shop page. Did we mention all of these are coming April 18? And you can preorder them starting March 29 from us or from your favorite retailer!